I have a pet theory about the survival of theatre as an art form: soon it will be the only thing you can't get on the internet. And despite the pandora's box of possibilities that technology offers us, it has yet to devise a way to compete with the alchemy of live performance, that willing suspension of disbelief where an actor, a creation of brown paper and string as Peter Sellers once described himself, can draw us into a world conjured out of nothing. "… not because they tell us that dragons exist, but because they tell us that dragons can be beaten". Likewise the power of simple theatrical storytelling endures because it reminds us that anything is possible in the realm of the imagination. The actor, Lucia Mastrantone, plays the character of Miss Woolf, a school librarian who is retiring - or being retired - because her world of pages and stories is thought outmoded in the new paradigm of interactive smartboards. To prove her doubters wrong, she transforms the simplicity of a few props into other worlds. The box is a traveller's trunk of hidden doors, secret drawers and magical flexibility. Combined with the actor's words, it became Jack's beanstalk, the Emperor's wardrobe, Hansel and Gretel's bed and with a few bursts from a can of shaving cream, a gingerbread house. How does that happen? Logically, it shouldn't. Where's the visual context, the frame, the CGI? Drawn in by the oldest devices of character and narrative, we followed the stories with the same fascination we hope to inspire in our target audience of four to eight-year-olds. To introduce our youngest audiences to the quintessence of theatre, that magical sleight of hand that happens when an actor and an audience are linked by that taut string of potential: what's going to happen next? How will you surprise us? And hopefully, they'll want to come back for more. 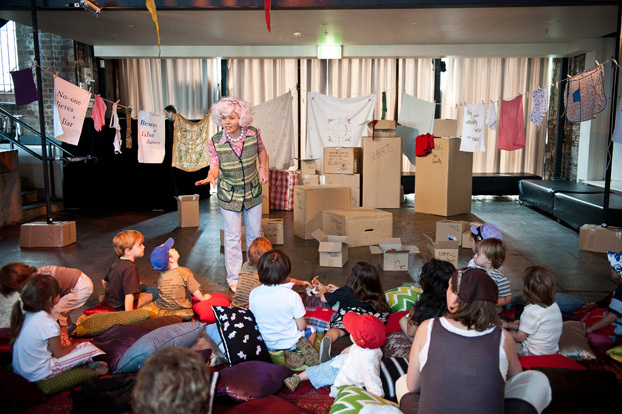 Actor on a Box: The Tale Maker plays in the Richard Wherrett Studio at Sydney Theatre from 12-22 April, 2012.